Pillow Alexander Design My Own! Our latest creation is causing a stir; and now amongst our most valued keepsake gifts. 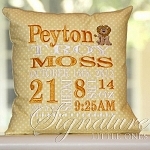 Surprise the proud parents with a pillow that celebrates the newest addition to their family. 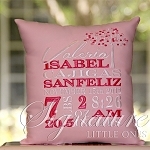 Our pillows commemorate your Little Ones birth with style, elegance and class. This keepsake pillow makes a fantastic gift or a chic addition to anyone’s decor; perfect to display on a chair, shelf or dresser or lean on the floor as an extra cushion. The pillows measure 11 x 11 or bigger depending on the length of the names. Each pillow can be personalized with baby name (up to 12 characters), date and time of birth, weight and length, and the first names of the proud parents, big sister or big brother; should you choose. You can omit any of this info if you wish, and we will design accordingly. These pillows are custom made to order and not returnable. All of our pillows are filled with 100% Polyester SUPREME Fiber fill. Washable and NON-ALLERGENIC, and they are typically turned around within 3-4 weeks. 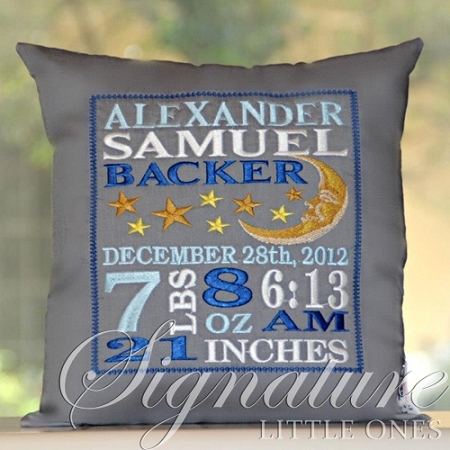 Our Birth Announcement Pillows are used for decoration and as keepsakes. Spot Cleaning is recommended. If you choose to machine wash, wash on delicate cycle (delicate drying) and please be advised that some colors may fade more than others and the pillow will lose its "new" look.